It would be awesome if all of us already had mobile phones that would be charged automatically every time you step out in the sunshine, but until that happy day, we have solar chargers to work with, like this one from i.Tech. 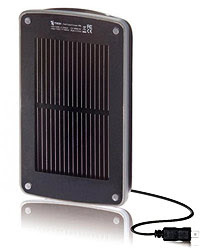 The Solar Charger 906 features a monocrystalline solar panel and also comes with 10 different adapter plugs to suit phones made by various manufacturers. It soaks up enough solar power to juice up your phone, but you can hook it up to a USB port to power up its rechargeable battery, too.